We provide custom individual and enterprise-wide leadership development solutions that supercharge executive performance and prepare next-generation talent for senior management positions. As independent advisors and behavioral scientists, we use the most advanced diagnostic tools to help our clients achieve rapid, enduring performance improvement. 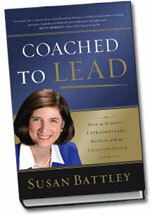 highly praised book, Coached to Lead. Step 1. Define: Identify success in terms of specific performance requirements, goals and desired outcomes. Step 3. Plan: Develop a detailed Action Plan with specific action steps, progress indicators and timetable. Step 4. Act: Implement the plan with the coach acting as facilitator, guide and sounding board. Step 5. Review: Evaluate behavior change and business impact against desired outcomes. Our systematic approach to leadership development starts with clarifying each organization’s unique requirements for their current and future senior executives. We design custom and facilitate custom programs that are powerfully aligned with mission-critical business objectives and that deliver enduring performance improvement results . Our goal for the business or organization is threefold: enhance executive effectiveness now; retain top talent; and prepare a core bench of next-generation leaders. Our deep expertise in leadership competencies and business pragmatics translates into winning and sustainable competitive advantage for our clients.